Ever wonder what to do with those stray leftover hot dog buns from your summer BBQ parties? Well, wonder no more, because I've got a fabulous way to re-purpose those leftover hot dog buns into a fun and delicious breakfast treat the whole family can enjoy...Hot Dog Bun French Toast! Thanks to Wonder ® bread for sponsoring this delicious post! And of course, you know all the opinions expressed here are 100% mine alone! This recipe for Hot Dog Bun French Toast is so good, you may not go back to making French toast with traditional bread again. 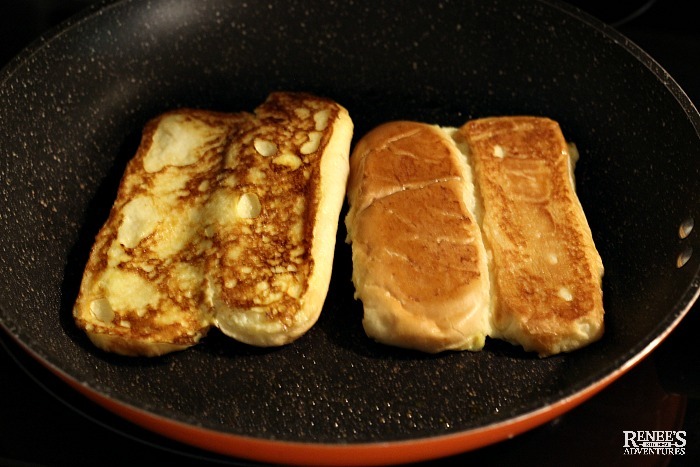 Hot dog buns make the best French toast ever! One of the reasons this recipe for Hot Dog Bun French Toast so good is that I start with Wonder Classic Hot Dog Buns. I love to use Wonder brand hot dog buns in this French toast recipe because Wonder bread is a name I grew up with and have always trusted. It's a brand known for baking wholesome and delicious bread products for more years than I've been alive (not to brag...but I've been around for some time!) So it's safe to say that the have a pretty good handle on baking great bread! 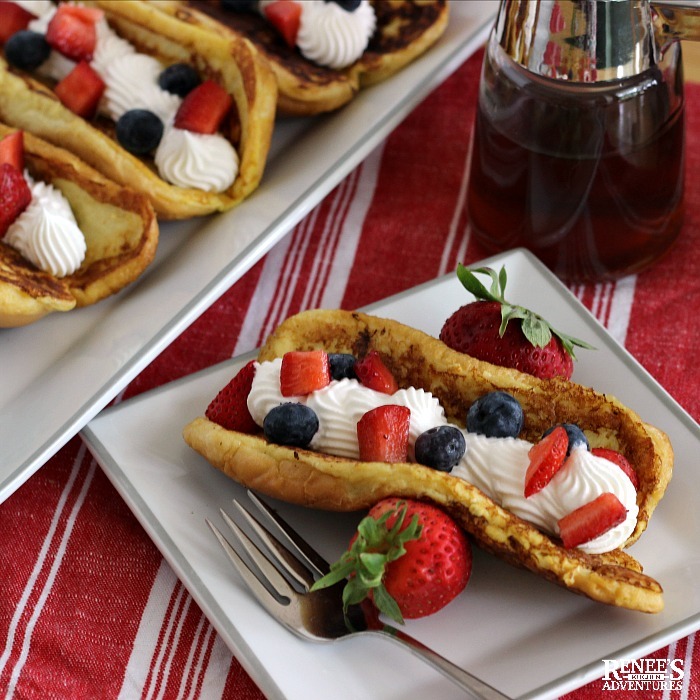 Serve this Hot Dog Bun French Toast recipe with a piping of whipped topping and cut up fruit inside. They look so patriotic with the white whipped topping and strawberries and blueberries, don't they? Speaking of patriotic, this summer Wonder has partnered with the United Services Organization (USO) to honor the selfless service of military men and women with their “Camo for A Cause” campaign. Look for special packaging on Wonder hot dog and hamburger buns with stars, stripes and camo at your local grocer now through July. This time of year, I find myself doing a lot of grilling. Hamburgers and hot dogs are a summer menu staple and the buns that go along with them are almost always in my pantry. Often, I have leftover hot dog buns that didn't get eaten at the BBQ. Just because they don't have a dog or burger to go inside them doesn't mean they can't still be enjoyed. They are still perfectly good! But, then comes the question of exactly what to do with these stray buns. The answer is simple. When life gives you leftover hot dog buns...make Hot Dog Bun French Toast! Hot Dog Bun French Toast is the perfect recipe to use up leftover hot dog buns. (You can also use fresh Wonder hot dog buns you've purchased just for this recipe too! ) I love how you can still fold the hot dog buns in half and eat them like a sandwich even after they've been transformed into French toast. Just make sure you wait until they are cool enough to handle before you indulge. Eating them with a knife and fork is, of course, perfectly acceptable as well. 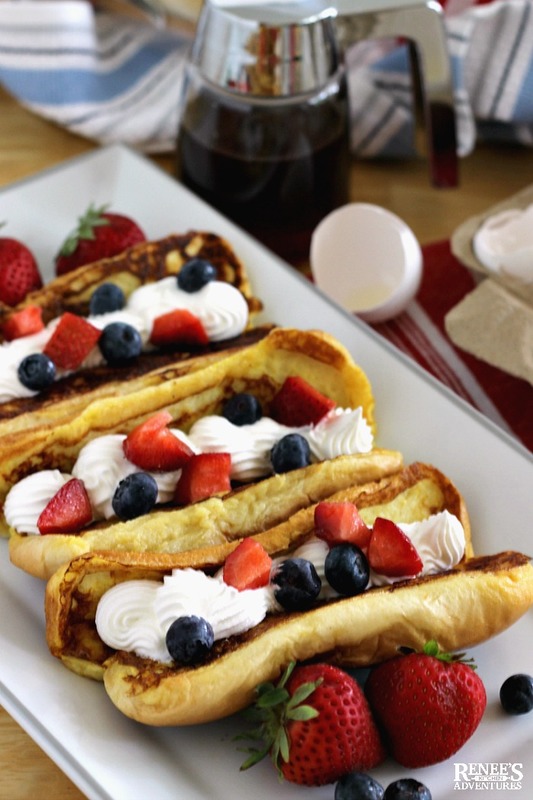 This recipe for Hot Dog Bun French Toast couldn't be any easier! With just a few simple ingredients you are going to end up with a unique kid friendly breakfast treat your whole family will love. To make Hot Dog Bun French Toast start by whisking together eggs and milk. Then dredge the buns in the egg mixture, taking care not to detach the top of the bun from the bottom. 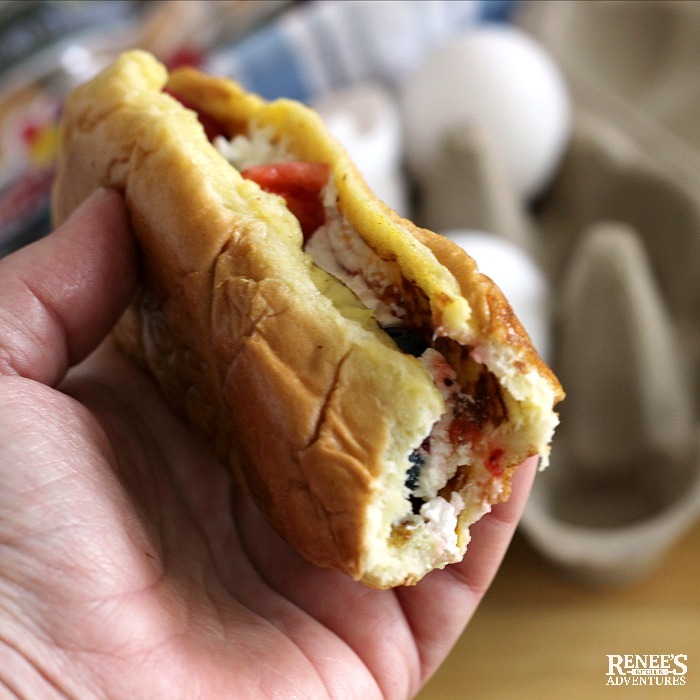 How long the hot dog buns take to absorb enough egg mixture will depend on their freshness. The fresher the hot dog bun, the quicker it will absorb the liquid. You can embellish the egg mixture with vanilla extract and/or ground cinnamon if you wish. But, I'll be honest, I love them just plain like the recipe is presented here. Once the bun has absorbed sufficient liquid, place on a hot skillet and cook until golden brown on each side. That's all there is to it! I love to use blueberries and strawberries in this recipe but you can use whatever fruit you like! You could also just top them with butter and syrup too. The possibilities are endless! 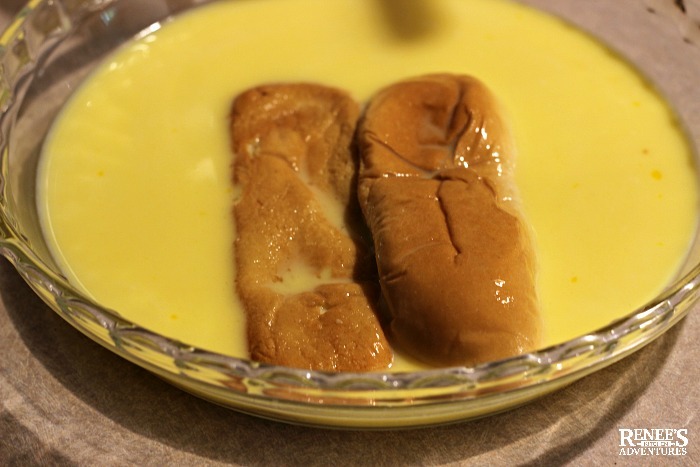 Using Wonder Classic Hot Dog Buns for the bread element in this recipe helps the French toast cook up nice and fluffy with a bit of custard in the center of the top side. So good you won't be able to eat just one! 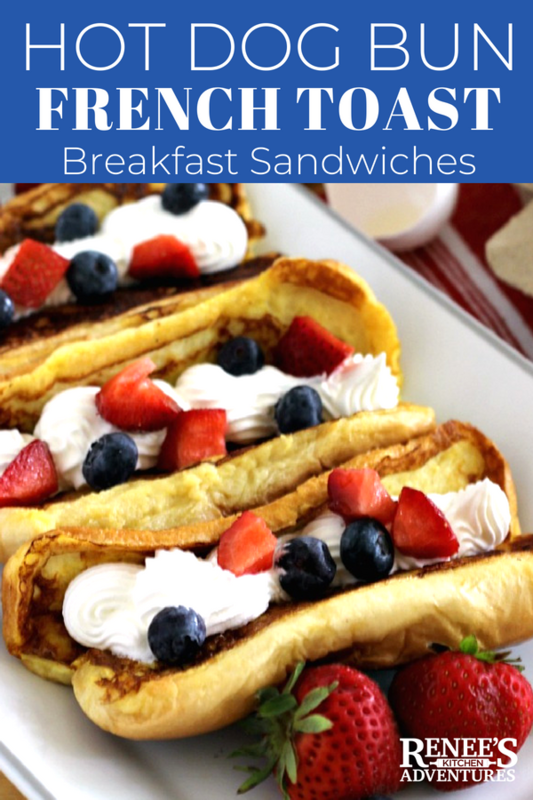 Leftover Hot Dog Buns are transformed into delicious hand-held french toast sandwiches filled with whipped cream and fresh fruit for a fun on-the-go breakfast treat ! In a large bowl, whisk eggs, milk, and salt. Pour egg mixture into a large pie plate. Set aside. Open hot dog buns so they are flat, but do not break the two halves apart. Day old or older buns work best. Working with one bun at a time, dip into the egg mixture and coat both sides. How long the bun takes to absorb the egg mixture depends on the freshness. Fresher buns will absorb the liquid faster. Add bun to pan, cut side down. If your pan has room for another bun, repeat the process and add the second bun cut side down. Cook until golden brown and flip to cook outside of the bun until golden. Remove to plate and keep warm. Repeat process for remainder of buns. To serve, pipe or spoon whipped topping into the buns and top with fruit. Serve immediately, Can be dusted with powdered sugar or topped with syrup. These can be eaten like sandwiches once they are cooled enough to handle or they can be eaten with a fork like traditional french toast. 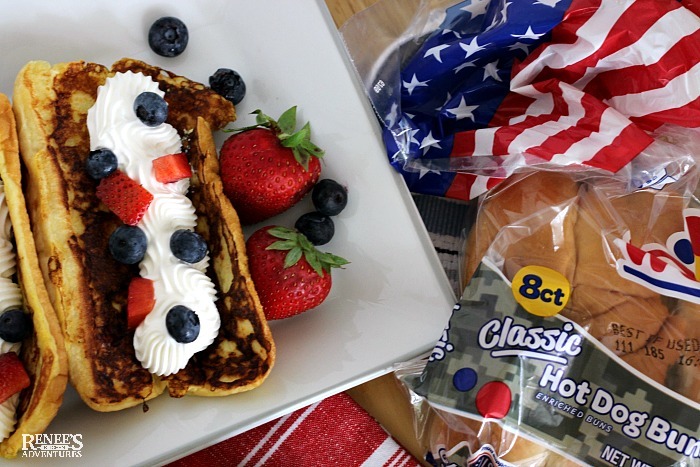 If you love Hot Dog Bun French Toast, don't forget to pin it! Wow, this looks incredibly delicious. I was a bit skeptical with the idea when I read the title, but now I really wanna try it! You are going to love them! So light and fluffy. I've made them now twice since this post has published and just picked up another package of Wonder Classic Hot Dog Buns to make them again this weekend!